Moving on in the same upbeat vein from the previous album, Sly & The Family Stone cemented their burgeoning reputation with this, their third album. The opener, “Dynamite!” is an upbeat, rhythmic slab of funky soul, with the trademark horn breaks and backing vocals. “Chicken” jumps on the contemporary “Funky Chicken” bandwagon, started by Rufus Thomas. Lots of clucking type vocals over a persistent, funky drumbeat. “Plastic Jim” has an “Eleanor Rigby” borrowed line in “all the plastic people, where do they all come from”. One thing that is apparent already in this album, is the funky guitar sound that is very dominant. “Fun” is another upbeat number that explores one of the band’s main recurring themes of unity and integration (another is partying and the groupie scene). This album is noticeable for its more rough and ready, straight up, musical approach. Very little use of studio effects. As on their debut album, they are almost playing “live”. 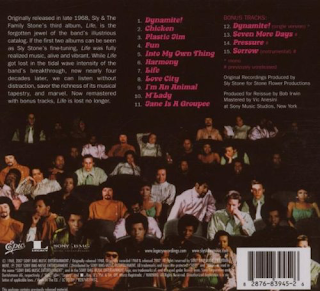 “Into My Own Thing” is a slowed down “Dance To The Music” type groove, in that the musicians are credited, “Cynthia And Jerry”, the horn players again, and the drummer. There is where the similarities end. It is much slower song, with some killer funky guitar. “Harmony”, once again, is upbeat and has excellent horns and vocals, as it now simply to be expected. 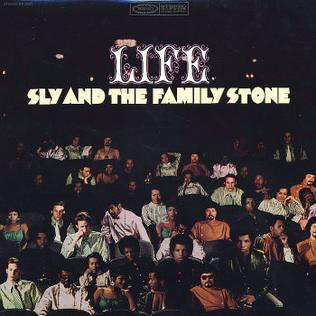 “Life” has a circussy horn intro (sort of popular in 1968 - “Sgt Pepper”, “Satanic Majesties” and “Magical Mystery Tour” all had that sort of vibe) but then it develops into a storming piece of vibrant funky soul. As throughout all these albums, Greg Errico’s drumming is superb. A most underrated drummer. “Love City” is a barnstormer of a track. Wonderful everything - horns, drums, vocals, bass. A piece of Sly funky heaven. Much of this album’s instrumental breaks have been latterly sampled by hip hop and electronica bands. Not surprising. “I’m An Animal” is a semi-experimental, innovative sort of jam that fits with the zeitgeist of 1968. They were all at it - The Beatles, The Stones, The Beach Boys, The Temptations, Jimi Hendrix, Cream. Although this track is ok, there are much better ones on this album and those before and after. “M’Lady” lifts so much from “Dance To The Music” that it loses a little bit of creativity - the guitar, The tenor saxophone, the organ riff, the “boom-ba-boom-bi-dum” backing vocals, even the solo pounding drum bit, they are all there. Still love the track though. Finally, “Jane Is A Groupee” must have been written by Prince! Again, Sly namechecks some of the band (presumably those who enjoyed Jane - “she’s got a thing about the guys in the band”). It is an amusing song that displayed the band’s always-present playful side. The extras are not as essential as on some of the other albums. “Seven More Days” is a bit of a shapeless throwaway, to be honest. “Pressure” is ok, but not worthy of a place on the album. “Sorrow” is an impressive instrumental though.